The Armstrong Clan was revived by Ted and Judy Armstrong on the night of the First Moon Landing, on 21st July 1969. The main objectives were to purchase former Armstrong land and towers on the Scottish Border, e.g. 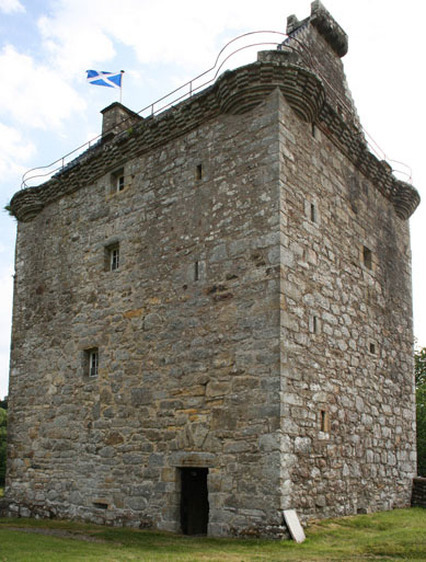 Gilnockie Tower and Mangerton Tower, to restore the most suitable for use as a focal point for Clan Members from all over the world. The Association's researchers hold extensive Genealogical Records from primary sources, and help members to discover their Armstrong Roots. We have an active Armstrong DNA research project, and cooperate with genetic specialists and historic researchers to develop a deeper understanding of the Clan's origins. Regular newsletters keep members updated, featuring Clan news and stories from around the world. The Association holds biennial Gatherings in the Scottish Borders, where members can meet and explore some of the most important sites in Armstrong Clan History. Association members can access our private Discussion Forum, our "Armstrong Country" maps featuring self-guided Border Reiver tours, and the Armstrong News. Click here and join the Armstrong Clan Association now, to support these initiatives and become an active part of this world-wide community. Current members can renew annually by clicking here.